Captain Jean-Luc Picard appears in seven seasons of Star Trek: the Next Generation and four motion pictures. He wears approximately 60 different outfits. For this fashion project I’ve broken the costumes into four sections for analysis: uniforms, incognito, fantasy, and casual wear. Simulations and Alternate Versions of Picard are included. I hope you enjoy! Space Suit – Coming Soon! 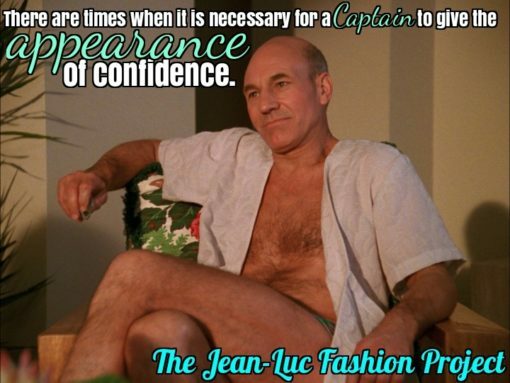 The Jean-Luc Fashion Project was first posted to tumblr in 2017. The posts have been shuffled and slightly edited for this repost. The JLFP will continue with the upcoming new series.